Nose : Red fruits (raspberry, black-current) and flowers (violet). Palate : Full, rich and ample, long finish, nice concentration. Pairs well with red meats, grilled meats, game and cheeses. 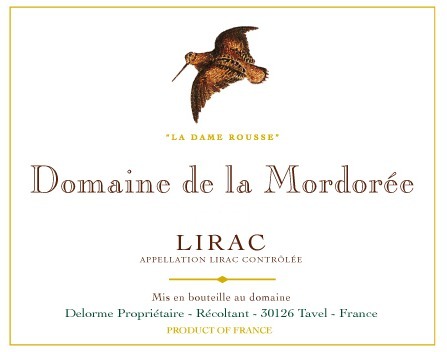 "A 50-50 blend of Grenache and Syrah, the 2016 Lirac la Dame Rousse offers hints of tar and black olive on the nose, then follows those up with ripe cherries, cracked pepper and a long, dusty finish. - Joe Czerwinski"
"Enticingly ripe, with dense raspberry and blackberry paste flavors forming the core while light anise, sweet spice and toast notes fill in around it. A licorice edge takes center stage through the finish. For the hedonist crowd. Drink now through . 2,300 cases made. –JM"
"Another outstanding wine is the 2016 Lirac La Dame Rousse, an even split of Grenache and Syrah, completely destemmed, that was brought up in tank. It offers a full-bodied, pure, elegant style that’s very much in the style of the vintage as well as lots of dark fruits, violets, pepper, and obvious minerality. I love its purity of fruit, it’s nicely balanced, and it’s just a beautiful wine in a fabulous vintage for the southern Rhône."